The time has finally come, Batman v. Superman is finally in theaters and DC has shown its cards. More than any other movie being released this year Batman v. Superman was the biggest wild card. A literal fresh slate for the company, everything except Henry Cavill’s Superman was brand new. But is it any good? In order to answer that properly we must dig deeper. SPOILERS AHEAD. First let’s get this out of the way. Batman v. Superman is in no way a perfect film. It has its share of flaws but nothing so bad that it is unwatchable or could be considered a black mark against the studio (I’m looking at you Green Lantern and Jonah Hex). The biggest issue comes from Jessie Eisenberg’s interpretation of Lex Luthor. Something about his arrogance and high pitched voice makes him totally unbelievable until the second half the movie. At that point his madness is earned and he plays it well. But the good far outnumbers the bad in the movie. Instead of taking things slow in their world building DC has instead chosen to assume that the world had been there all along we just never saw it. It is quite literally the opposite approach of Marvel and really the only option they had to make themselves look unique. But none of it feels forced. There are quite a few surprise cameos in the film that, when announced, made it sound overstuffed but all of them come about rather organically. 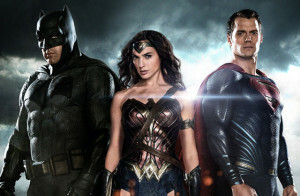 Ben Affleck, Gal Gadot and Henry Cavill are the new trinity of the DC Cinematic Universe. Any hesitation people have about Ben Affleck playing Batman will be gone the first time you see him fight. He has the moves and it is hard not to imagine him as a more battle weary version of Christian Bale’s Batman, the two have a lot in common. Gal Gadot has more than earned herself a movie as well even with the short time she has on screen. Any problems that may have arisen from the trailer are solved by the time the credits roll. Director Zack Snyder has done his homework and clearly knows the source material well. He is the perfect person to build the world but not the person to expand on it. His work on the highly underrated Watchmen proves that he is in his element with ensembles but stumbles on character pieces. That is why Man of Steel doesn’t always feel right, Snyder needs more room to breathe and work with bigger themes. In the end this movie will speak most to comic book lovers. I don’t mean the ones that watch the movies I mean the ones that grew up reading the actual comic books. The tone and style feels like a comic book should with a lot of dynamic characters filling the space. Marvel has accomplished that with flying colors but it was a slow road to get there. DC has seen the signs that the world is ready for something more complex so it seems to be going full steam ahead with the kind of movies that comes right from the pages of graphic novels. Truly, it is a wonderful time to be a geek.